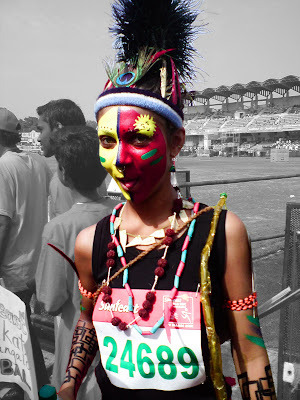 "Majja Run" or "Sunfeast 10K Bangalore Marathon" was held last Sunday at kanteerava stadium. It was really like a mini carnival. Thousands and Thousands of people gathered at the stadium, i un-officialy heard that it crossed around 23000 [apologies for the typo mistake. thanks asit] (uh) . Though it was termed as "10K Marathon", i believe only few hundreds were actually running for the timings. Those who run for the timings, should get the timing chip in-advance, with a deposit of Rs. 500, and more than that, there was a huge queue for that too. It was good that, there was an option to choose between 10km (with numbers in red colour) and 5+km (with numbers in green colour) running. So it was easy for many to choose the second one, tho they luv to go for the first ;) . Only the 10K runners were given Participation Certificate. So, for others, It was truly Majja Run only. I can see lot and lots of groups/organizations flocked in the stadium, with one reason, RFC "running for cause", tho they were for so many different causes. Me, as a part of Oracle Volunteers, had combined with CRY.org (Child Rights and You), to bring awareness to the people on the Child Rights. So, we got an Yellow CRY T-Shirt, which had messages written about the Child Rights. We all assembled near the CRY stall, opposite to the Mallaya Hospital, and started our RFC together. We entered the stadium through Gate 11 and by the time we went in, we could see the Prize distribution ceremony for the winners of the marathon shown in the Stadium Screen. Similar to Us, several companies had combined with several 'non-profit' organizations, all RFC. i couldnt believe that, there so-many such organizations. Each one were allowed to start the run in separate intervals, and our chance came after 45mins since the real race has ended. Everything was fine, except one thing, which i felt very very VERY bad in this Majja Run. They were giving small Kingfisher water bottles all along the running path. It was really a nice one, but those people who got those, just senselessly threw the bottles on the road. both the sides of the road were completely filled with waste water bottles. we hav to run/walk on the middle of the road only. even few feet away from the center, u're sure to stamp on waste bottle. And those people, who threw, are the ones who are campaigning for some cause. was worried very much on, Why those people never bothered about this one. Only for this reason, i would say, this is not at all a "majja run". And the worst thing was, there was campaign for Zero Waste too. i have no words to describe how pathetic it is. I still doubt whether all those waste empty bottles were taken off and recycled in proper place. Hope they did the Cure atleast, though they didnt prevent it from happening. I ran the Majja Race this year for the very first time and was very much disappointed to see the horrible management of the event especially majja race. Let me put it straight I don't know how much money was totally pumped into the event and how much actually went towards the charity. I have ran quite a few races here in India and overseas but never seen such a chaotic event before in my life. The event needs lot of improvement. Also I think not everyone knows that 10K is not an official athletic event. 10K and the 5K(Majja) are just an Majja event and it should not be projected as a world athletic event. Sad to see that corporates and management in Bangalore can't even organize a decent world event. I am sure the foreigners who participated in this event will definitely not talk high about Bangalore's Sunfeast event. Me too a first time participant in this event. And no-one knows really how much money has gone for the real charity. Hoping to be positive in that. As you have pointed it, i too wont consider this as a "World Athletic Event", but definitely this one qualifies for the "Majja Run". Costume contest, Glamor Ambassador, Cheer girls at the water counters, what else you expect for Majja Run. I felt that the pendulum swinging more towards considering as the "Biggest Marketing Event of the Year". I could see banners, placards of various Products, huge sponsorships, and thousands gathering at a single place.